It took store owner Diana Walker less than 60 days to find the 32 artists looking to sell their work. These artists face several difficulties that come with working in a mass-produced economy, Jasmine Scarlatos, a St. James-based artisan, said. The Long Island art market is difficult for young new artists to break into, with many struggling to find places to sell their work. 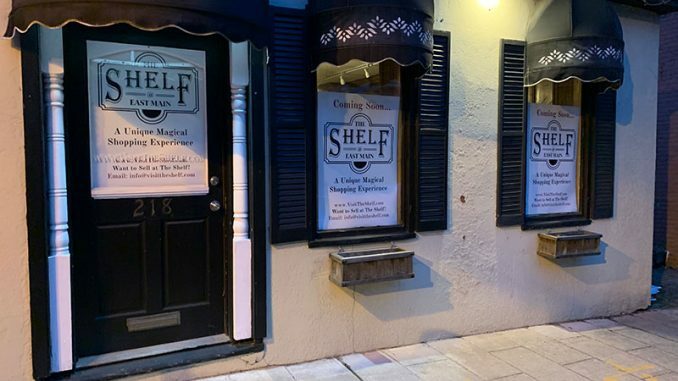 “You can [sell] A piece, you find if you work really hard,” Diana Walker, owner of The Shelf, said. Many art events on Long Island, such as the Art Walk that takes place in May in St. James, require an entry fee of $25 to $50 — sometimes even more. The fee comes with no guarantee that the artist will actually sell their work. The art market is growing, Judith Leavy, executive director of Gallery North in Setauket, said. But, there are still not many options for artists to showcase and sell their work. “I would say that there are a limited number of options right now, however we’ve recognized that and we have made efforts to change that,” Leavy said. The main goal of the store, Walker said, is to give opportunity and space to young artists at a time when their work might be overlooked. The plan is to have a “revolving contract.” Every 90 days, the inventory in the store will be cycled to give time and space to each artist. Rather than having the contract connected to the artist, it will be connected to the inventory. This means that artists will write a new contract with the store every time their inventory sells out. Not paying for art has become so common that a subgroup on the website Reddit, called /r/choosingbeggars makes fun of stingy consumers reluctant to pay for goods or services. “If it’s online a lot of the time [the customer] will be very agreeable at first and then when it comes time to pay they’ll delay payment or they’ll say ‘do you think it’s really worth THAT much?’ Even if you’ve lowballed it a bit to begin with,” Morgan Richard, another Long Island-based artist involved with The Shelf, said. Scarlatos and Richard are not the only artists interested in the store’s business model, which originally planned to showcase 20 artists upon opening. Walker said that she will find a way to display all those who are interested. The art business and consumers have become obsessed with the traditional, Walker said. That’s why artists like Scarlatos are struggling to find ways to get their art noticed and purchased. She says that consumers are weighing the difference between quality and price, and in most cases, they decide that lower prices are more important than higher quality art. But Scarlatos does not necessarily disagree with the consumer’s point of view.